This is for all the people who predicted the Arizona Diamondbacks to win the NL West last spring. This is for all the people who said the Giants were finished with Brian Wilson was lost for the season. This is for all the people who said the Dodgers were the team to beat in the NL West after building a 7.5-game in late May. This is for all the people who said Pablo Sandoval didn’t deserve to be an All-Star (yeah, were talking to you Sandy Alderson. By the way, thanks for Angel Pagan). This is for all the people who said the Giants couldn’t win with Tim Lincecum posting a 5+ ERA. This is for all the people who said trading for Marco Scutaro was a sorry excuse for answer to the Dodgers’ acquisition of Hanley Ramirez. This is for all the people who said the Giants were REALLY done after Melky Cabrera was suspended. This is for all the people who said the Giants were done after falling behind 0-2 to the Reds in the NL Division Series. This is for the people who said the Giants were done after falling behind 1-3 to the Cardinals in the NL Championship Series. This is for all the people who said the Tigers were the CLEAR favorite over the Giants in the World Series. This is for all the people who said the Giants should give up on Pablo Sandoval, Barry Zito, Brandon, Belt, Tim Lincecum and Hunter Pence. This is for all the people who called the Giants 2010 World Series title a fluke. The Giants are up 3 games to none in the World Series, which is better than 2-1 and certainly better than being down 1-2 or 0-3. But nothing is certain. And the Giants don’t need to give the Tigers a spark. So here are 10 good reason why the Giants need to finish this TODAY. NO. 10 — The 49ers play on Monday night. San Francisco fans don’t need dueling sporting events. If the Giants don’t win Sunday, they would play at 5:07 p.m. Monday with the 49ers kicking off vs. the Cardinals at 5:30 p.m. in another key NFC West matchup. So, c’mon Giants, let’s clear the schedule for the 49ers. MoreSplashHits follows three sports teams in the fall: the San Francisco Giants, the San Francisco 49ers and the Oregon State Beavers. We haven’t been able to get two wins on the same day this October. On Saturday, Oct. 6, the Beavers beat Washington State, but the Giants lost to the Reds. The next day, the 49ers buried the Jets, but the Giants lost again to the Reds. On Oct. 13, the Beavers beat BYU, but the Giants were off. The next day, the 49ers lost to the N.Y. Giants, and the Giants lost to the Cardinals (a bad day). The following Thursday, the 49ers beat the Seahawks, but the Giants lost to the Cardinals. The next Saturday, the Beavers beat Arizona, but the Giants were off. And yesterday, the Giants beat the Tigers, but the OSU lost to Washington. The Giants and 49ers would both play Monday if the Giants don’t seal the deal Sunday. So, Giants, seal the deal. The Giants are up 3-0 and they haven’t even thrown their ace. It can’t work out much better for the Giants. Plus, Matt Cain was on the mound when the Giants clinched the NLDS vs. the Reds. He was on the mound when they clinched the NLCS vs. the Cardinals. He’s out there again. While the Giants throw out their ace, the Tigers counter with their No. 4 pitcher. Yes, Scherzer has a postseason ERA under 1.00, but he’s also been battling a shoulder issue. This should be the Giants’ big opportunity to score some runs. NO. 5 — History says they should win today. Of the 23 teams to go up 3-0 in a best-of-seven World Series, 20 have gone on to clinch in Game 4. The three others won in Game 5. Sunday’s forecast is good in Detroit. But rain creeps in the picture on Monday with 40 percent chance of PM showers. If those showers are heavy and persistent enough to postpone the game, rain is in the forecast all day Tuesday, and it remains in the forecast in some form Wednesday and Thursday. The Giants tagged Justin Verlander in Game 1. The odds of a repeat are long. Yes, they beat Cliff Lee twice in 2010, but the second game was much tougher than the first. Zito has been very, very good his last two starts. The Giants have won his last 14 starts. Do we really want to temp that mojo? Something has to give eventually, and I’d rather that happen next April. Giants fans have endured enough stress and angst, not only this postseason, but the entire season. We don’t need more stress. Not sure we can take it. A party is ready to happen. LET’S DO THIS NOW!!!!!!! 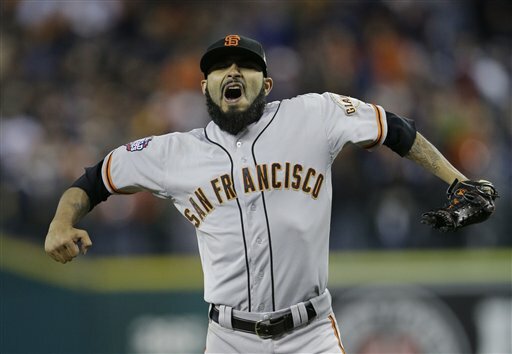 San Francisco Giants lead World Series 2-0 — Thank God. There was a frightening play in Game 2 of the World Series on Thursday. In the second inning, the Giants’ Gregor Blanco hit a liner back up the middle that hit off the top of pitcher Doug Fister’s head and fell in front of center fielder Austin Jackson for a single. The Tigers’ training staff rushed out to check on the Detroit pitcher, who appeared to be fine. Still, they asked him the usual questions. What the hell was Gene Lamont thinking by sending Prince Fielder home on that double to left? In game in which there were several key plays, the play in the top of the second loomed as the largest. To set the scene: Fielder was on first base with no one out. Dmitri Young laces a double inside the third base bag. Blanco played the ball off the wall near the Giants bullpen as Lamont waved Fielder home. From there, everything went perfectly for the Giants. Blanco hit cut-off man Marco Scutaro, Scutaro threw a strike to catcher Buster Posey, Posey applied a quick sweep tag to the sliding Fielder and umpire Dan Iassogna made a great — and correct — out call. And while it took a perfect play to get Fielder, the decision to send him home was still questionable. 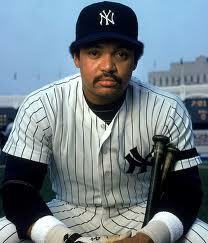 Tigers manager Jim Leyland called the decision “over-aggressive.” Even Lamont had second thoughts. That would have been the right call. It would have put runners on second and third and no outs — against a pitcher who had struggled in his previous two outings. And as the Giants would later show, you don’t need a hit to score a run. But Lamont wasn’t totally at fault. 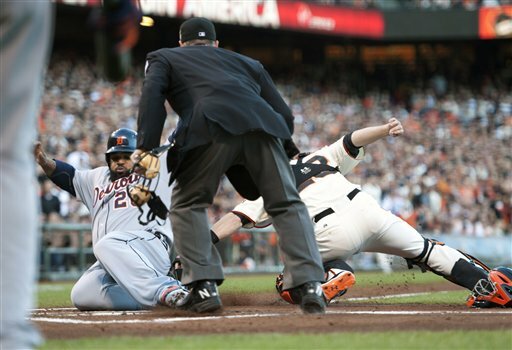 On the slide at home, Fielder’s lead leg went right over the plate, and the first contact he had with the plate was his bent sliding leg, giving Posey a split-second more to apply the tag. And then there was on-deck hitter Jhonny Peralta, who must have been too busy pondering why his first name is spelled the way it is to get into proper position to alert Fielder that the throw was coming to the inside of the plate and his slide should have been wide. In a tight game, it’s the little things that can prove to be big. And some good luck helps, too. Someone upstairs must like the black-and-orange. The Tigers thought they got some good luck when Omar Infante’s bouncer into the hole at short handcufffed Brandon Crawford for an infield. Then, the luck changed. Miguel Cabrera hit a rope to third base that was snagged by Pablo Sandoval. Then Fielder hit a shot to left that in many ballparks might have been a home run. In AT&T, it was a warning-track fly out. Then in the seventh, the Giants started a rally with a single by Hunter Pence, who has been in a major funk at the plate this postseason. After Fister was lifted for lefty Doug Smyly, Brandon Belt worked a walk. Blanco came up to bunt the runners over. After working the count to 3-1, Blanco dropped a bunt that traveled 40 feet along the dirt between the grass and the third-base line for an infield hit. Was it his best bunt ever? With the bases loaded and no one out, Leyland decided to play the infield back. He got the double-play ball he was looking for from Brandon Crawford. But it allowed Pence to score the game’s first run. In the eighth, the Giants loaded the bases on walks to Angel Pagan, Pablo Sandoval and Buster Posey, giving Giants fans visions of the walk-aided seven-run eighth inning in Game 2 of the 2010 World Series vs. the Rangers. But this time, Pence fell behind 0-2, as he has so often done this postseason. But this time instead of striking out, Pence fouled off a couple of pitches before lifting a fly ball to right center for a sacrifice fly and a 2-0 lead. So the Giants lead the Tigers 2-0 in the series after scoring two runs on outs and getting seven shutout innings from Madison Bumgarner, who had an 11.25 ERA in the 2012 postseason entering the game. They’ve got a double off the third base bag, a single that traveled 40 feet and a perfectly executed outfield relay play home. The Giants have to be feeling pretty fortunate. So are the baseball gods shining on the Giants? Stop me if this sounds familiar to you. The Giants open the World Series by smacking around the American League’s best pitcher who entered the series with three standout postseason performances and a playoff ERA under 1.00. They follow that up by shutting out an American League lineup that includes the potential league MVP in Game 2. And Madison Bumgarner throws up nothing but zeros in his first start of the series. 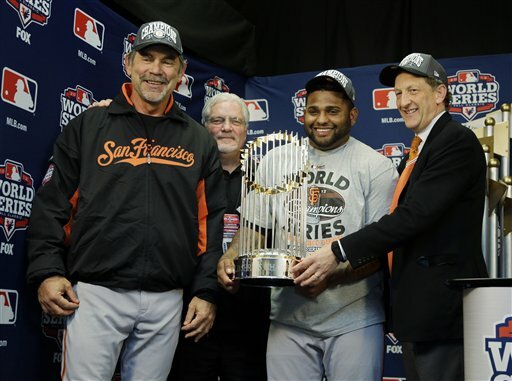 No, Giants fans, this is NOT the 2010 World Series, but it sure feels like it. Even the Giants acknowledged as much. And don’t tell Bumgarner this is not the 2010 postseason, because after two sub-par playoff starts, MadBum recaptured his magic on the mound. Bumgarner silenced the Tigers’ bats with seven shutout innings, allowing just two hits and two walks while striking out eight. MadBum’s performance coupled with another night of solid defense and just a little bit of luck was enough to propel the Giants to a 2-0 victory in Game 2 of the World Series, and a 2-0 series lead. About the only thing Bumgarner didn’t do was extend the team’s streak of having a pitcher drive in a run in a fifth consecutive postseason game. So it leads to the question: What was the difference between this game and Bumgarner’s two previous starts in which he posted an ERA of 11.25? “I went into the seventh inning instead of getting took out in the third,” Bumgarner said. Nah, c’mon Madison, get serious. So Righetti is some kind of miracle worker then? Bumgarner made three bullpen sessions on Righetti’s supervision between Game 1 of the NLCS — a 6-4 loss to the Cardinals when MadBum gave up all six runs in less the four innings of work — and Thursday’s Game 2 of the World Series. They also studied video, finding that MadBum had bad mechanics that was leading to unnecessary stress and fatigue on his arm. After the third session, the Giants decided Bumgarner was ready to return to the rotation. And was he ever. When this series started, most Giants fans were hoping the Giants could split the first games with the Tigers, given that Barry Zito and Bumgarner were set to start. Then the plan was to get the series back to San Francisco for Games 6 and 7, and hope the Giants’ run of postseason magic could continue. Now they head to Detroit with a 2-0 series lead and their two best pitchers this postseason — Ryan Vogelsong and Matt Cain — taking the mound there. And thoughts now turn to returning to San Francisco simply to have another parade. But if anyone knows not to get ahead of themselves, it’s these Giants. Game 1 of the 2012 World Series featured three Cy Young Award winners, and one of them got rocked. 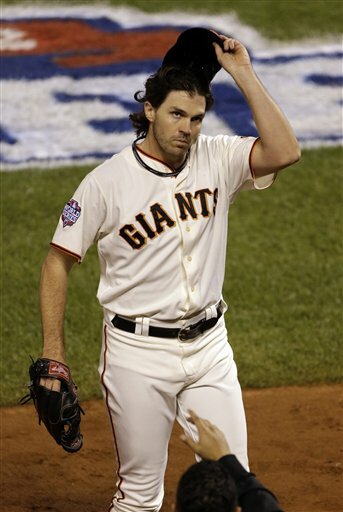 On an amazing night at AT&T Park, Zito had another amazing outing. Zito gave up one run on six hits and one walk in 5 2/3 innings, striking out three. Zito didn’t want to come out with two outs in the sixth, after throwing 81 pitches. Eighty-one pitches to get through almost six innings?!?!? From Zito!?!? He needed 76 to get through 2 2/3 in Cincinnati two weeks ago. 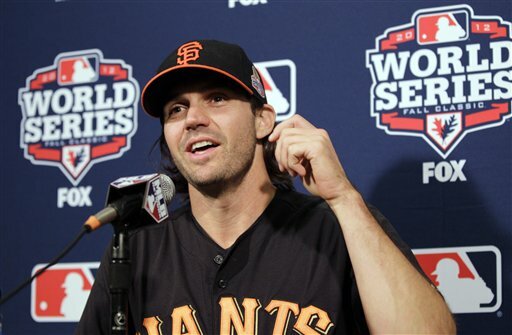 But in the past two postseason starts, Zito has been efficient with his pitches. He’s stayed in the strike zone, pitched to contact and trusted his defense. On Wednesday, they helped him out. Gregor Blanco made two very nice sliding catches on sinking liners off the bat of Miguel Cabrera and Prince Fielder. He got Dmitri Young to hit into a double play with a chop off the plate that was fielded nicely by Buster Posey. When Zito averages fewer than four pitches per batter faced, good things happen. In Game 5 of the NLCS, he averaged 3.97 pitches per batter. In Game 1 of the World Series, it was 3.52. In Game 4 of the NLDS vs. the Reds, it was 4.75. In his final five starts of the regular season (all Zito wins, four of which were quality starts, the other one out from a quality start), Zito averaged 4.15, 3.81, 3.54, 3.78 and 3.88. And then there was Tim Lincecum, who retired all seven batters he faced in 2 1/3 innings of relief, striking out five of them. In Lincecum’s one postseason start, he gave up four runs on six hits with three walks and three strikeouts in 4 2/3 innings. In his four postseason relief appearances, he’s given up one run on three hits with one walk and 14 strikeouts in 10 2/3 innings pitched. Clearly, the bullpen is the place for the Freak this October. And Bochy was brilliant to leave him there. If there was one complaint about Bochy’s usage of Lincecum, it’s that I would have rather seen Lincecum not used in Game 1 to nurse a 6-1 lead when there were only 10 outs to get. I felt like the Giants could have managed the relief innings Wednesday with the likes of George Kontos, Jeremy Affeldt, Jose Mijares and Santiago Casilla. I would have felt much better with the Freak in the pen in Game 2, behind the out-of-whack Madison Bumgarner. After Lincecum had only needed 19 pitches to get four outs, I thought Bochy should have gone to another reliever after the Giants added some insurance runs. But Lincecum came back for the eighth. Apparently Bochy made a commitment not to use Lincecum on back-to-back days, however many pitches he used. But Bochy’s thought process probably was that it was better to use a committee of 4-5 relievers in the event of another meltdown by MadBum in Game 2, given the day off on Friday, than to use the pen heavy in Game 1. Or ever better, we won’t have to see … provided that Bumgarner can give the Giants 5 or 6 quality innings. But that’s something we haven’t seen a lot of in the past two months. It’s a good thing the Giants signed Pablo Sandoval through his arbitration years. Otherwise, his representation would do a little name dropping at the Panda’s hearing. As in Babe Ruth, Reggie Jackson, Albert Pujols … and Pablo Sandoval. The Panda became the fourth player in World Series history to hit three home runs in a game. In one way, the Panda is in a class by himself. 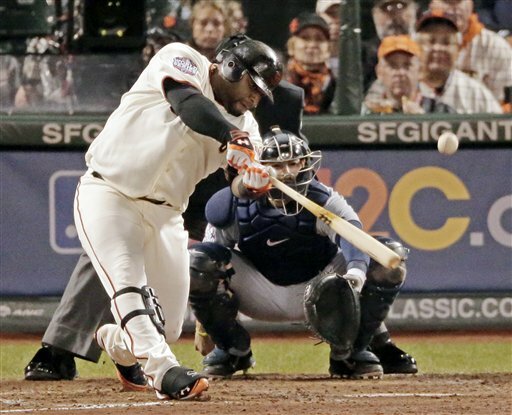 Sandoval became the first player to hit home runs in his first three plate appearances of a World Series game. Sandoval came up with two outs in the first inning. He fell behind 0-2 to Detroit’s Justin Verlander. Verlander’s third pitch was a letter-high fastball that Sandoval hammered over the center-field fence 410 feet away. In the third inning, Sandoval came up after the Giants had scored a run on an Angel Pagan double off the third base bag and a single by Marco Scutaro (yet again). This time, Sandoval worked ahead on the count 2-0, drawing a visit to the mound from Tigers’ pitching coach Jeff Jones (who I loved in Ferris Bueller’s Day Off, by the way). On Verlander’s next pitch, a fastball on the outer half of the plate, Sandoval went the opposite way, smacking the ball over the left-field run for a two-run shot and a 4-0 lead. The shot drew a “wow” from Verlander. In the fifth, Sandoval came up with one out against reliever Al Alburquerque. Sandoval threw his bat after swinging and missing on the first pitch. When the bat landed near the Tigers’ dugout, it broke the handle. The Panda fetched another bat, and after a ball in the dirt, he served the ball deep over the center-field wall. Sandoval came up once more in the game and simply lined a single to center off Jose Valverde, ending a 4-for-4 night. To look at Sandoval’s night another way: Last year, the Cardinals’ David Freese was the World Series MVP with 8 hits, 4 runs, 1 HR and 7 RBI for the series. On Wednesday night, Sandoval had 3 hits, 3 runs, 3 HR and 4 RBI. 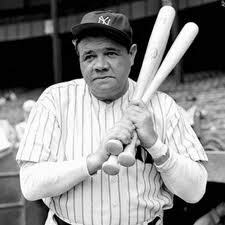 The last three times a player had a three-homer game, his team went on to win the World Series. Ruth’s Yankees beat the Cardinals in 4 in 1928, Jackson’s Yankees beat the Dodgers in 6 in 1977 and Pujols’ Cardinals beat the Rangers in 7 in 2011. Here’s a look at other three-homer games in the World Series. Ruth went 3 for 3 with two walks. He hit a solo off in the first and a solo in the third against Flint Rhem and a two-run shot in the sixth off Hi Bell. Ruth went 3 for 5. He hit solo homers off Bill Sherdel in the fourth and seventh innings and another solo off Pete Alexander in the eighth. Jackson went 3 for 3 with one walk. He hit a two-run shot off Burt Hooton in the fourth inning, a two-run homer off Elias Sosa in the fifth and a solo shot off Charlie Hough in the eighth. 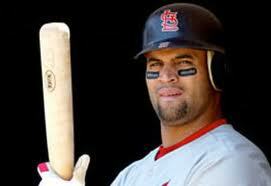 Pujols went 5 for 6 with two singles. He hit all three of his homers off relievers — a three-run shot off Alexi Ogando in the sixth inning, a two-run homer off Mike Gonzalez in the seventh and a solo shot off Darren Oliver in the ninth. Last Friday, prior to Game 5 of the National League championship series, someone asked me if I was confident with Barry Zito on the mound vs. the Cardinals. I responded that no Giants fan is ever confident with Zito on the mound. That’s because you just never seem to know which Zito is going to show up: the one who keeps hitters off-balanced or the one who walks in runs. So to make Giants fans feel better about this Barry Zito vs. Justin Verlander matchup in Game 1 of the World Series, we came up with seven good reasons why you should feel good about Barry Zito. NO. 1: We’ll start with the obvious one. The Giants have won their last 13 games when Zito has started on the mound. NO. 2: It’s true that the Giants have won each of Zito’s last 13 starts sometimes in spite of Zito — he has a 3.56 ERA over that stretch. But since Sept. 9, he is 6-0 with a 2.57 ERA. NO. 3: Against teams that advanced to the postseason this year (Reds, Cardinals, Braves, Rangers and A’s), Zito was 4-2 with a 2.98 ERA in eight starts. NO. 4: Zito has 2.96 ERA in 9 postseason starts. It would be much less if we took out Zito’s lone postseason start vs. Detroit (in 2006). NO. 5: The Giants score runs when Zito pitches. After giving Zito 3.7, 3.0 and 3.5 runs of support per start in 2008, 2009 and 2010, the Giants gave Zito 4.8 runs of support in 2012. During the 13 game win streak in Zito starts, the Giants have averaged 6.23 runs. NO. 6: Zito’s last start against the Tigers in 2011, he gave up no runs on five hits in six innings of work. The Giants won that game 15-3 over Max Scherzer. Brandon Crawford and Pablo Sandoval homered in that game. To put the game into context, Zito opened his season by injuring his ankle in his third start of the season in Arizona. He then missed the next 2.5 months. Actually, he was hurt the next six weeks then he spent nearly a month in Fresno on a rehab stint after Ryan Vogelsong had seized Zito’s spot in the rotation. But the Jonathan Sanchez imploded, so Zito came off the DL. He gave up 2 runs in 7 innings vs. the Cubs, then the start in Detroit, then gave up one run in eight innings vs. the Padres. Then Zito’s season went to heck and he didn’t make another start after July 31. NO. 7: In Justin Verlander, the Giants are facing a pitcher with an ERA of 0.74 in his three previous postseason starts. In 2010, the Giants faced Texas’ Cliff Lee in Game 1 of the World Series. Coming into that game, Lee had an ERA of 0.75 in his three previous postseason starts that year. 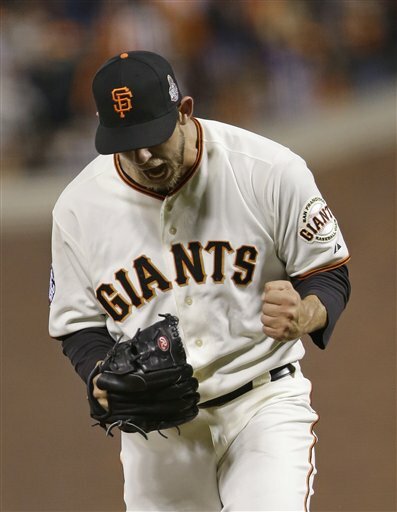 The Giants jumped on Lee for 7 runs (6 earned) in 4 2/3 innings en route to an 11-7 win.